46 | TH E M R EP O RT O R I G I NAT I O N S E R V I C I N G DATA G O V E R N M E N T S E C O N DA R Y M A R K E T THE LATEST ORIGINATION THE 2018-2019 FIVE STAR EVENTS LINEUP MARK YOUR CALENDAR NOVEMBER 14–16, 2018 PR18 SAN JUAN MARRIOTT RESORT SAN JUAN, PUERTO RICO FIVESTARPR18.COM Join representatives from industry-leading organizations in Puerto Rico for a series of collaborative discussions on the current state of housing and sustainable solutions for an island in the midst of recovery. 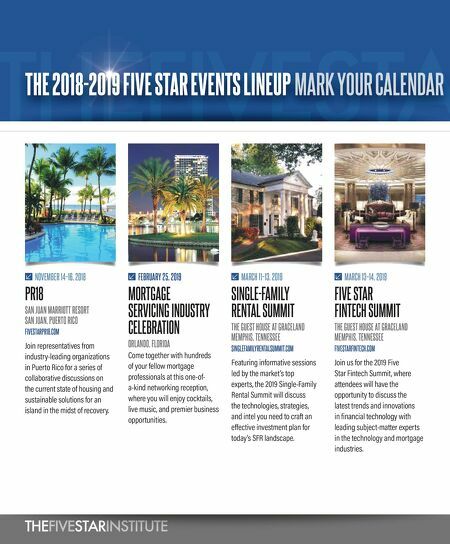 FEBRUARY 25, 2019 MORTGAGE SERVICING INDUSTRY CELEBRATION ORLANDO, FLORIDA Come together with hundreds of your fellow mortgage professionals at this one-of- a-kind networking reception, where you will enjoy cocktails, live music, and premier business opportunities. MARCH 11–13, 2019 SINGLE-FAMILY RENTAL SUMMIT THE GUEST HOUSE AT GRACELAND MEMPHIS, TENNESSEE SINGLEFAMILYRENTALSUMMIT.COM Featuring informative sessions led by the market's top experts, the 2019 Single-Family Rental Summit will discuss the technologies, strategies, and intel you need to craft an effective investment plan for today's SFR landscape. 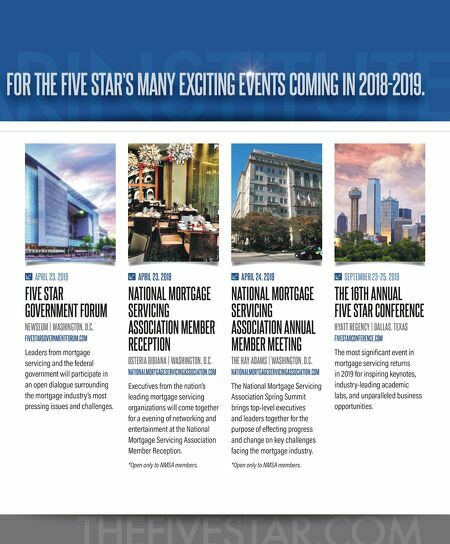 MARCH 13–14, 2019 FIVE STAR FINTECH SUMMIT THE GUEST HOUSE AT GRACELAND MEMPHIS, TENNESSEE FIVESTARFINTECH.COM Join us for the 2019 Five Star Fintech Summit, where attendees will have the opportunity to discuss the latest trends and innovations in financial technology with leading subject-matter experts in the technology and mortgage industries.